The Kawasaki Nomad 1500 fairing bolts to factory windshield brackets, mounted on the sides of the forks. There are 2-3 different types of factory windshield brackets for this bike. The windshield brackets on the sides are 5 1/2" (center to center). Supplied brackets fit this type. If your windshield bracket is 2 1/2" (center to center) you may drill into the bracket. You may need a 1/2" spacer depending on your factory windshield bracket. You can purchase the spacer at your local hardware store. The Vulcan 1500 Classic comes without windshield brackets and you will need to purchase factory windshield brackets that mount on the side. 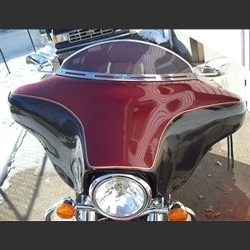 You can buy Nomad 1600 factory windshield bracketd to add to this bike. Please check your local Kawasaki Dealer. The Nomad 1600 fairing bolts to the original factory windshield brackets, mounted on the sides of the forks. The Kawasaki 1600 Classic may come without factory windshield brackets. The Factory Nomad 1600 windshields bracket will bolt onto your Nomad 1600 Classic. You may need to purchase the Nomad windshield bracket to install the Nomad fairing.